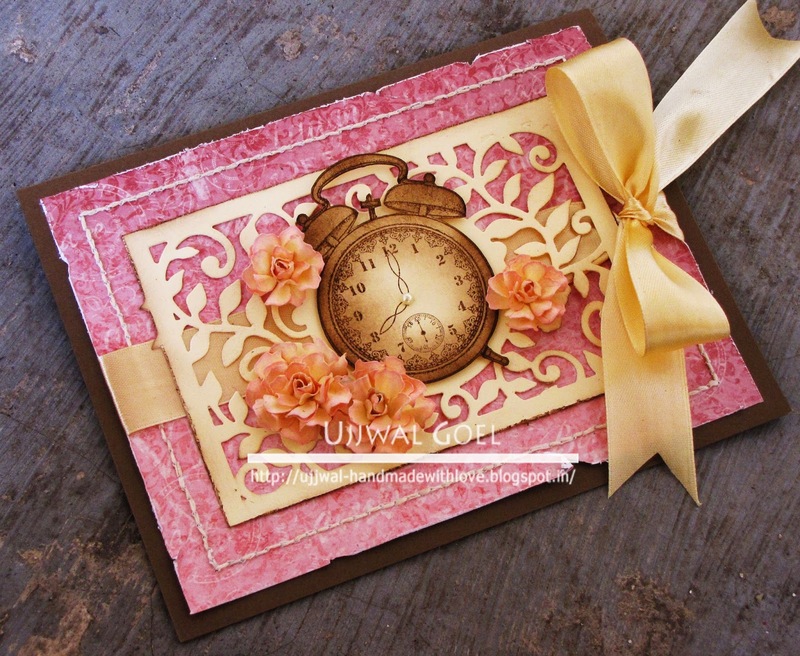 Start with a A4 size brown card and fold it in half to prepare a card base . Cut a piece of pattern paper to size from the Once Upon a Time Paper collection. Distress the edges, hand-stitch all around and tie a ribbon bow around it. Adhere to card base. Cut a decorative leafy frame from another piece of card stock. Distress the edges and ink lightly with walnut stain distress ink and adhere on top of the pattern paper. Stamp the alarm clock image from the Alarm and Watch PreCut Set using brown sugar ink and fussy cut. 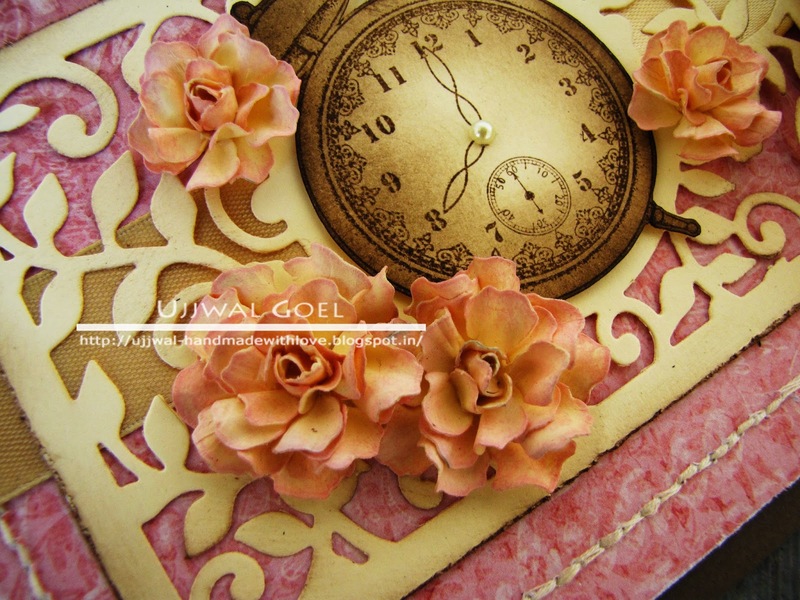 Adhere the clock using foam adhesive in the centre of the leafy frame. Die cut flowers using the Vintage Floret die, ink their edges with pink ink, mist with water, mould to shape and assemble them into roses. Adhere to card. Add a pearl to the centre of the clock to finish it off. Ujjwal, this card is simply stunning. The color combination reminds me of the roses my mother in law used to grow...all peach and bright pink. The flowers are delicate and oh, so beautiful! Everything about this card makes me smile! I love it, the frame and clock together are fantastic!!!!! Stunning card. Your flowers are beautiful. Wow,what a beautiful creation , Ujjwal ! Thanks so much for joining us for Lulupu 2nd Birthday Celebration and challenge #27. Thats a stunner !!! :) Love the wooden frame it really adds to the beauty of the colors u picked !